Oswald Cooper (1879–1940) was one of the four leading American type designers of the first half of the twentieth century. Most know his name from the ubiquitous—and often unfairly denigrated—Cooper Black. This talk will survey all of Cooper’s typefaces, including some that were never completed; examine the close connection between them and his lettering; and look at how that lettering has inspired typefaces by others. 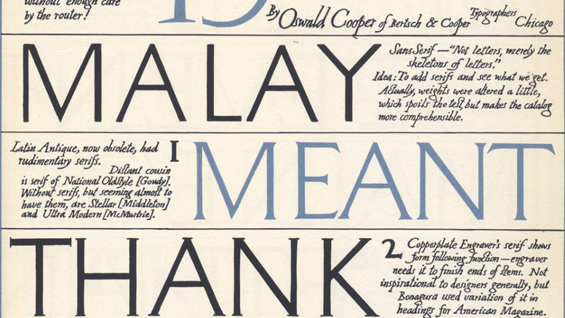 Cooper’s work will be assessed in light of his contemporaries Frederic Goudy, W.A. Dwiggins and Morris Fuller Benton. Paul Shaw is a letter designer and graphic design historian. He is the sole proprietor of Paul Shaw / Letter Design, a studio specializing for thirty years in calligraphy, lettering and typography. Among his clients have been Clairol, Origins, Lord & Taylor, Campbell’s Soup, Cinzano, Vignelli Associates, and Pentagram. Paul was formerly a partner in LetterPerfect, a digital type foundry based in Seattle. Since 1980 he has taught calligraphy, lettering, typography and graphic design history at a variety of New York area design schools. Currently he is at both Parsons School of Design and the School of Visual Arts. He writes on letter-related subjects for Print, Eye, Baseline, Letter Arts Review, and AIGA's Voice. His book Helvetica and the New York City Subway sold out in two months, with a trade edition planned to be published by MIT Press. In 2002 Paul was a fellow at the American Academy in Rome. Finally, Paul is the reigning authority on W.A. Dwiggins, having spent 30 years researching his life and work.